I wanted to take a few moments to welcome you to our practice and let you know a few very important things to help you get the most out of your care. First thing is – Our practice is referral driven, so we run a very “open” office. By this, I mean we value your opinion and want to hear what you think, no matter what it is. If you like something – tell us so we can do more of it, and if you don’t like something – tell us that too. The only way we can make your experience with us the best it can possibly be is if we know what you want. Again, if there is something you do not like – tell us RIGHT AWAY, so we can rectify the situation. Do NOT be intimidated. We are only happy when YOU are happy. Second: We want you to feel better and reach your goals as fast as humanly possible – for the least cost. We want to make sure you get out of pain and stay that way for the longest time possible. This means we will give you the best recommendation and treatment plan we feel will do that. Your treatment plan will be personalized for you. We do NOT hand out “canned” treatment plans to everyone. You are an individual and so is your treatment plan and the way we approach it. If you have any questions about our recommendations or your personalized treatment plan – just ask. Like I’ve already said, we want to make this the best possible experience for you. We want you to get the most out of this – in the least time – for the absolute lowest cost. So please, if you have ANYTHING to comment on, we are all ears. And third: I would like to say thank you for putting your confidence in me. I have worked very hard over the last 9 years to help as many patients as possible and build a great reputation, and I want to make sure I live up to my reputation for you because nothing matters unless YOU are happy. So once again… WELCOME! I look forward to helping you achieve everything you came in for – as fast as possible. *** For those who are not sure if Chiropractic will help you, we offer a free consultation, no strings attached. Call today to schedule for a consultation. ** All new / existing patients are seen same day. 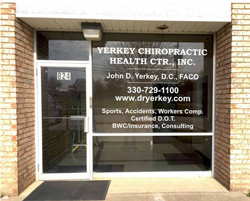 Website © 2010 Yerkey Chiropractic Health Center, Inc.